To the untutored this might seem an uninspiring proposition, but it’s perfectly possible to eat noodles every day and perhaps even several times a day without feeling as though it’s an endurance test. 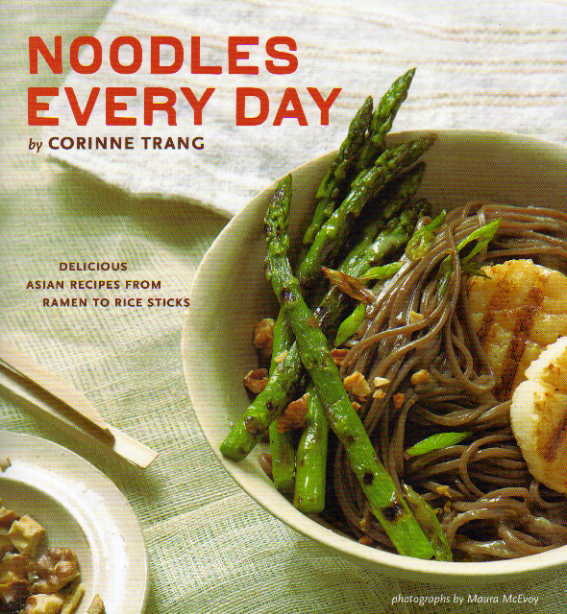 Corinne Trang is a US based author, radio and TV broadcaster on the subject of Asian food. She is a well respected authority on foods from China and Southeast Asia and has been described as the “Julia Child of Asian Cuisine” by the Washington Post and me. Corinne has penned numerous books and has won a raft of awards – her very first won Best Asian Cuisine Book in the World at the World Cookbook Fair. Not too shabby! Corinne has a passion for food and not just Asian food (a casual conversation with this lady about anything from bread to breakfast will have you drooling). Her background, a combination of French and Chinese, equips her very well to take her place in the culinary arena of both East and West. Noodles Every Day is an attractive volume with marvellous photographs by Maura McEvoy. It’s more than a cookbook – this is an encyclopaedia of all things noodley. Every possible variety of noodle is considered and a wealth of recipes is offered. This is the original fast food and it’s both healthy and sustaining which is more than can be said for most of the popular western alternatives. Every noodle type has its recipes but you can mix and match to suit your own taste. The five noodle categories are Wheat, Egg, Buckwheat, Rice and Cellophane but there is an additional chapter which covers Buns, Dumplings, and Spring Rolls. Although these are not noodles they do fall under the “snack” umbrella as do some of the noodle dishes. Corinne introduces you to stock making and some typical Asian condiments, as well as basic ingredients. You will have all you need to be ever ready, with the addition of a few fresh items, for a quick but impressive meal… and fast! Wheat Noodles with Spicy Ground Pork is a Szechuan classic. Dishes from this region are prized for their robust flavours and this one is no exception although the stir-fried Napa cabbage (Chinese Leaves) adds sweetness. Stir-fried Egg Noodles with Beef and Broccoli is another meat and vegetable recipe and a worldwide restaurant favourite but it’s easy to make at home. It’s flavourful, rich and comforting. One of the most striking recipes in Noodles Every Day is that for Egg Noodle Soup with Five-spice Duck. This would make a smart dinner party dish with its succulent, aromatic meat and the soup served on the side. For sheer luxury though, Crab-flavoured Noodles with Velvety Crab Sauce and Green Peas takes some beating. It’s a simple recipe but has a cheffy quality about it. The crab-flavoured noodles can be found in larger Chinese food stores but if you can’t get hold of them you can substitute regular thin egg noodles. Noodles Every Day is an instructive and inspiring book. It’s thoughtfully written with the western cook in mind but Corinne Trang is never pedestrian in her choice of recipes. This isn’t just another Asian cookbook but rather a vehicle which will help you to appreciate all the subtle flavours and textures that Asian food has to offer. Noodles Every Day will surely be another award winner.